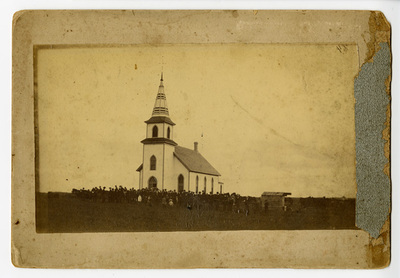 "Camp Release Lutheran, Granite Falls, Minnesota"
Congregation outside of Camp Release[?] Lutheran. Back of photograph labeled, "Camp Release Mgh's kirke Yellow Medicine Co, Minn. Byget aaret [begun] 1887. Disbanded".